Home What's New ITC boards the RailYatri Express! Long hours of train journey present a perfect opportunity for you to munch away at those packets of chips, some cakes and of course quench your thirst with fruit juices! 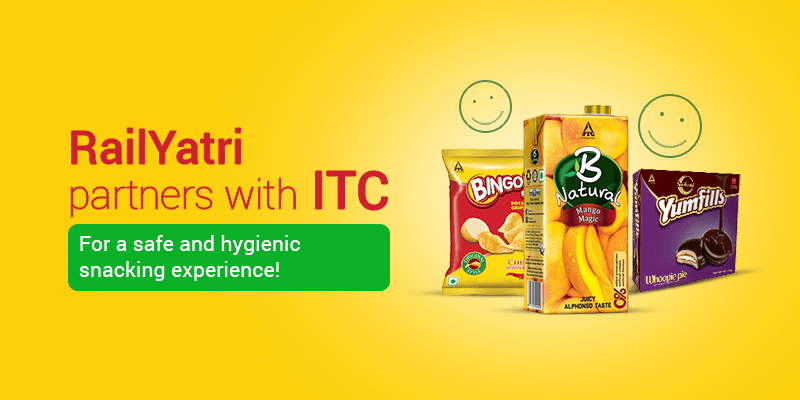 If you love snacking while on the go, then RailYatri presents a hygienic option to order for your choice of snacks items from the reputed FMCG brand – ITC. Yes, you heard it right we have partnered with ITC and integrated some of their best snacks items in our food on train menu. 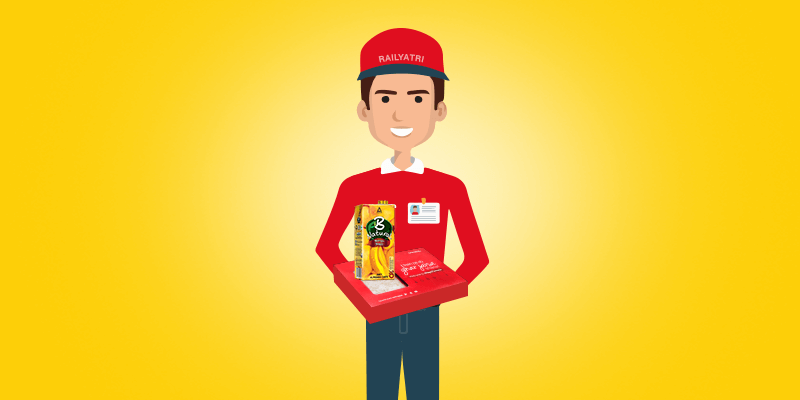 From Bingo chips to Yumfills cakes and B Natural fruit juices, you can order it all from your beloved RailYatri app. Why this partnership is a good news for train travelers? 2019 has been an eventful year for us at RailYatri. We have launched new services as well as tied strategic alliances, with the vision of solving some of the long standing train travel problems. By partnering with ITC we want to remove one such pain point for the train travelers. We understand your love for snacks while travelling. And we also know, when you want to buy a packet of chips or some fruit juices you have to settle for products that are available with the station-side food vendors. Many a times you end up purchasing products from unknown brands, and by doing so you put your health at risk. When you buy a product bearing the logo of ITC or their subsidiary Sunfeast you can be rest assured that your health would not be compromised. ITC Products that you can order right away! Though ITC has bucket-loads of products, but in the initial phase we have selected only a few of the popular items. But we promise you this list of products would only increase, based on your interests, with the passage of time. Presently we have integrated the following ITC products in our meals on train menu. 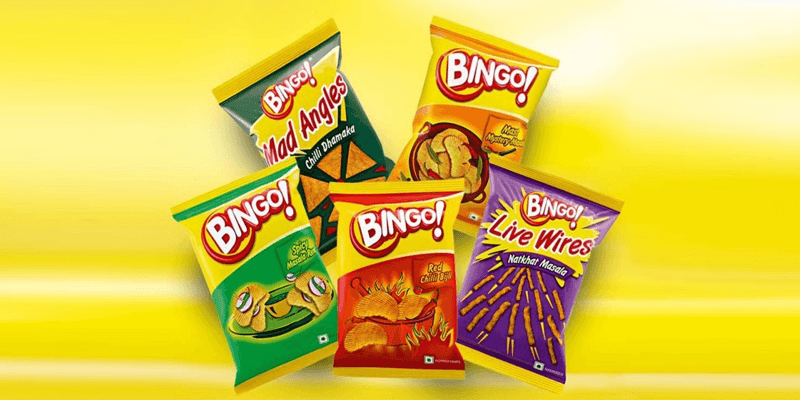 Bingo Chips are presently, one of the most sold chips product in India. 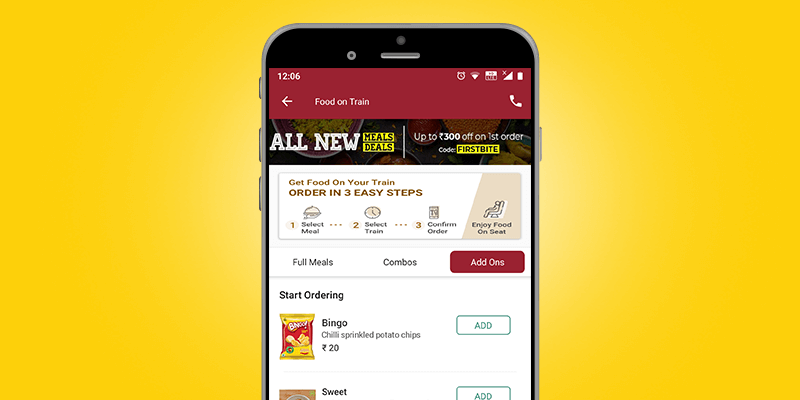 So, if you want to fulfill your journey experience by munching at Bingo Chips just open the RailYatri app and there in the food menu you would find the option of selecting these healthy chips. But before you place an order, do care to select the variety you love the most. For Bingo Chips come in array of flavors and shapes. You would as much love the second product on our list. 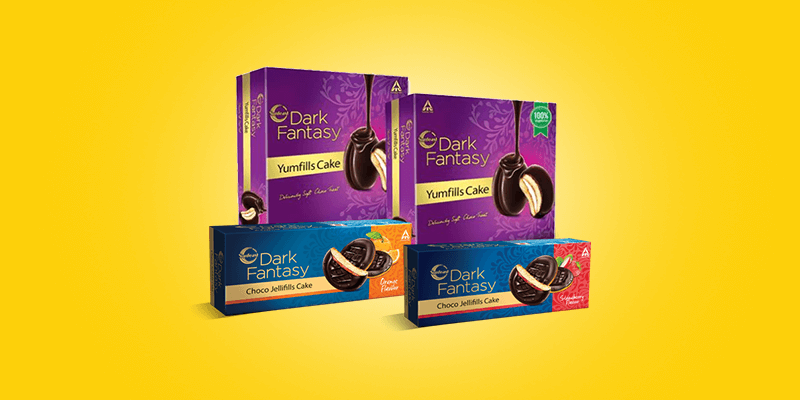 Yumfills cakes are very popular among people of all age groups. Sunfeast’s Dark Fantasy is an all-time favorite. Coated with Chocolate, every bite gives you a blend of solid and molten chocolate. Of course, if you like experimenting then you may as well order the cakes that come in Coffee, Strawberry or Orange flavors. The summers are upon us, and this is the season when you would want to quench your thirst not with cold drinks but some real fruit juices. So, order B Natural juice from the RailYatri and sip in the real fruit extract. ITC claims that 0% concentrates are used while manufacturing this product! So they are completely healthy. 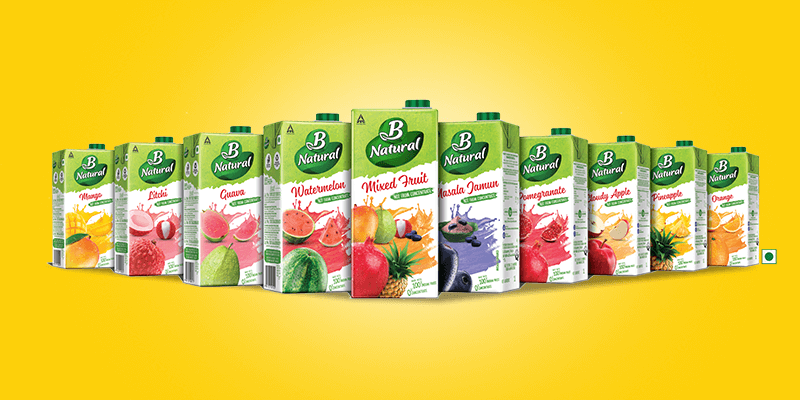 B Natural juice is available in an assortment of flavors – Mango, Litchi, Guava, Mixed fruit, Orange and many others. Choose the one that tickles your taste buds. How to book ITC products at RailYatri? 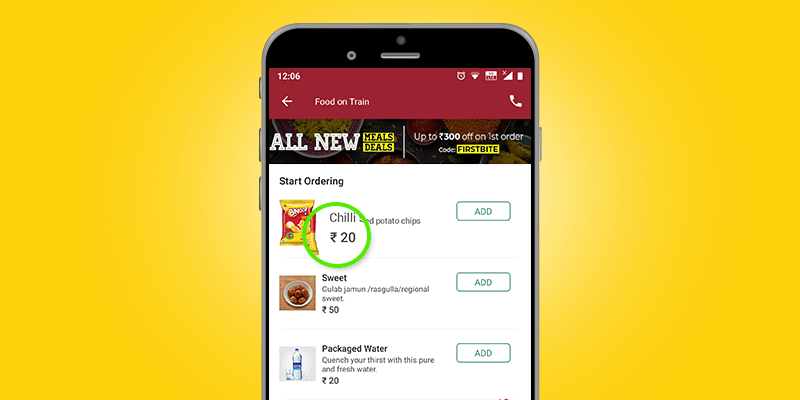 It is as simple as ordering meals on train through the RailYatri app. Select the ITC product you want delivered to your train berth, share your journey details (such as delivery date, Coach number, berth number and the preferred station for delivery, etc. ), make the payment and you are done! Can I book ITC products solely? ITC products have been implemented as a part of our pilot project, and we would expand the scope for such snacks product deliveries depending on your patronage. But presently you cannot order for a packet or two of Bingo chips or other products in the above mentioned list, solely. You have to couple it with other food items in the RailYatri food on train menu. What would be the pricing on ITC products? Unlike opportunistic station-side vendors, we at RailYatri would never overcharge you. You would be paying as per the MRP set against the product. Though presently we do not have any discounts on the ITC range of products, but depending on the patronage for such products we might launch an offer in the future. So, keep checking our offers section. Now that you know about the availability of ITC products on RailYatri, do make your next journey better by ordering them through our app. Previous articleHonk, honk! RailYatri Smart buses have arrived!